Rayce is a wanted man and dangerously charismatic, the worst person for Rose to get involved with, no matter what his smile promises. But he assumes Rose's attempt to take him hostage is part of a plot to crush the rebellion, so he takes her as his hostage. Now Rose must prove where her loyalties lie, and she offers Rayce a deal—if he helps her rescue the other girls, she'll tell him all the Garden's secrets. 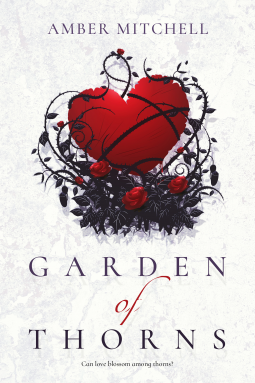 Amber Mitchell's debut, Garden of Thorns, takes originality to a new level! In this marvelous epic fantasy novel, readers will be taken in by fearless characters and their action-packed adventure. She has crafted a well-balanced story that gives attention to delightful world-building and a memorable cast of characters. The story begins on a high note that lasts until the final word. Rose has lived a majority of her life in captivity under the Gardener. When she acts on a chance for escape she finds herself within the ranks of a rebel army. Its leader, Rayce, wants to help her free the other Flowers left behind in the Garden, but only if Rose can prove herself trustworthy. Rose has found it hard to put complete trust in men, but she must learn to believe in the rebel leader if she wants to keep her promise to the Flowers. Her plight instantly merits attention from readers because she's following a path that not only seems impossible, but could put her in the middle of war. If you loved Mary E. Pearson's Remnant Chronicles, you'll love Garden of Thorns. The stories are unrelated, but Rose reminds me so much of its heroine Lia. Their secret pasts and desire to protect those with little power of their own make both stories worth reading. Garden of Thorns, however, is more immediate in giving readers what they want. It doesn't take long for the action to roll in and it comes in waves throughout the story that magnify the pacing of the plot. Another reason readers shouldn't miss out on this story is because it's pure entertainment. From the flames of attraction between Rayce and Rose and the blossoming friendships, there's no shortage of quips and memorable moments. The story ends too soon, but I hope it will pick up in another installment. There's so much more left to learn about Rose's world and the one she left behind. I'll be waiting (im)patiently for another story from Amber Mitchell in the meantime!